This recipe is one of my favorite new recipes. We all love cheesy mashed potatoes right? Well dish this is the mature, more sophisticated cousin of the delicious cheesy potatoes. The goats cheese gives the potatoes a funky (in a good way) kick. The presentation of the potatoes looks very elegant as well, not to mention will make your guests think you put in way more effort than you really have to! 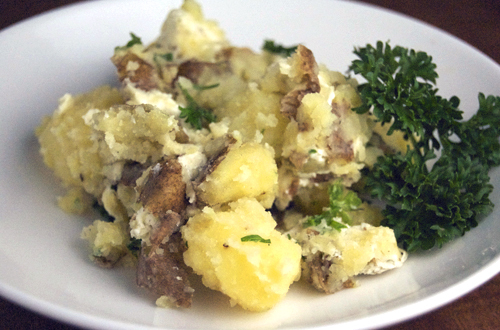 Even if you think you don’t like goat’s cheese, I suggest you try this recipe because I have had multiple people who say they don’t like goats cheese try these potatoes and love them! Boil a large pot of water, add the potatoes and let cook until very soft (about 30 minutes). Drain the water and roughly smash the potatoes together with the butter, salt and pepper. Chop the goat's cheese into small cubes then toss into the smashed potatoes. I have known that goad cheese is more digestible, in american population that many american suffer in lactose intolerance, this is okay to use because it is a good choice if you have an allergy to traditional dairy products. Goat cheese happens to be more easily digested than conventional dairy products. I right there with ya! I adore goat’s cheese (had it last night over some roasted root veggies)! Up until a couple of months ago I thought goat cheese tasted like burnt plastic (not that I’ve ever cooked up a Barbie and taken a bite but that’s what I thought it would taste like). For some reason a few months ago all of that changed and now I can’t get enough of the stuff! I love goat cheese. I am not the biggest fan of potatoes but I would love to try it with goat cheese. Haha, I wonder if my husband would notice. I love goat cheese one of my favorites, there are so many cheeses that I love. anyway great recipe, I should try it some time soon. 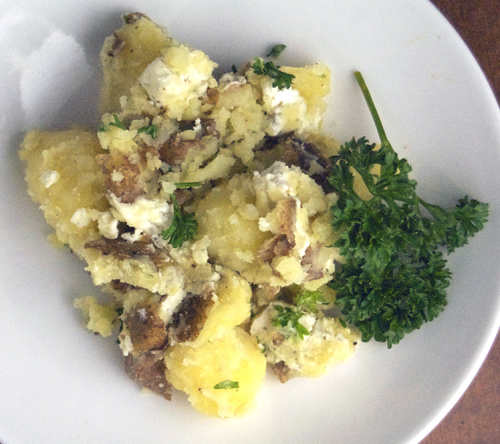 The parsley goes great with potatos and the goat cheese. That’s pure comfort food. What’s better than cheese and potatoes! Oooh my sweetie is going to love this! We are HUGE fans of goat cheese and in potatoes? perfection. Wow these potatoes look beautiful! Love the goat cheese too. Yum! My husband would be in heaven if I made these! He also has an addiction to goat cheese! He thanks you already! Oooh goodness, I just got a whole thing of goat cheese and am dying to make something with it. These potatoes sound awesome. Goat cheese mashed potatoes are THE BEST. A truly comforting indulgence! The combination of flavours in this potato treat is unbeatable! This sounds sooo good!! I am totally hungry for this now!!! Yummy! I love this idea with goat cheese. That is one of my most favorite cheeses and I’m happy to see it put into potatoes! Yummy! Wow, this looks fantastic. I know what we’re having for dinner this weekend! Love that this uses goat cheese. I want to make this with some flavored goat cheese that i pick up from the ladies at the farmers market! Yeah, I used a garlic and herb goat cheese and it went so well!